Is this the world’s happiest man? One of the things I’ve discovered in the wine importing business is that winemakers aren’t like most of us. I mean, I know people who like their jobs, and some who will even say they like them a lot. But they don’t hold a candle to the winemakers I’ve come to know. All of our producers are justifiably proud of their wines. They’re taking an agricultural product that has a pretty significant chance of variability from year to year and making it into something great. Better years make better wines, but the winemakers revel in the complexity of making their grapes into wine even in off years. The combination of chemistry, alchemy, and art is intoxicating to them. Even if there are some aspects of the actual business they don’t necessarily like, they’re a happy bunch. But one of our producers, Jean-Baptiste Pietavy of Domaine de Mairan, stands out as the happiest winemaker I’ve ever met. In fact, given the high level of contentedness in the profession already, I’m thinking he’s in the running for the world’s happiest man. Maybe it’s his outgoing personality – where some people are a little reserved on first meeting, Jean-Baptiste is more open. Maybe it’s that he’s still in his early 30s. Or maybe it’s also because he was about to become a new father when we last saw him. Whatever the reason, he uses the adjective “ravi” a lot – it roughly means excited or delighted – and Cy and I found ourselves saying it too after meeting him. As I mentioned in a previous post, Cy and I first met Jean-Baptiste not at his winery, but at a tasting in a hotel that serves his wines. Three years later, we finally went to Domaine de Mairan to visit him and see the winery. First, though, a little bit about the area and its wines. Domaine de Mairan is in Puisserguier, in the Languedoc in southwestern France. The region designates red wines made from Grenache and Syrah for the official appellation of Coteaux du Languedoc and the other named appellations in Languedoc-Roussillon (meaning they contain the name of a specific area, like AOC Corbières or AOC Minervois – click here for an explanation of the AOC and the rules for naming French wine). But the vast majority of the wines in the region are Pays d’Oc, a designation that allows for other grapes to be used but still carries a mark of quality. 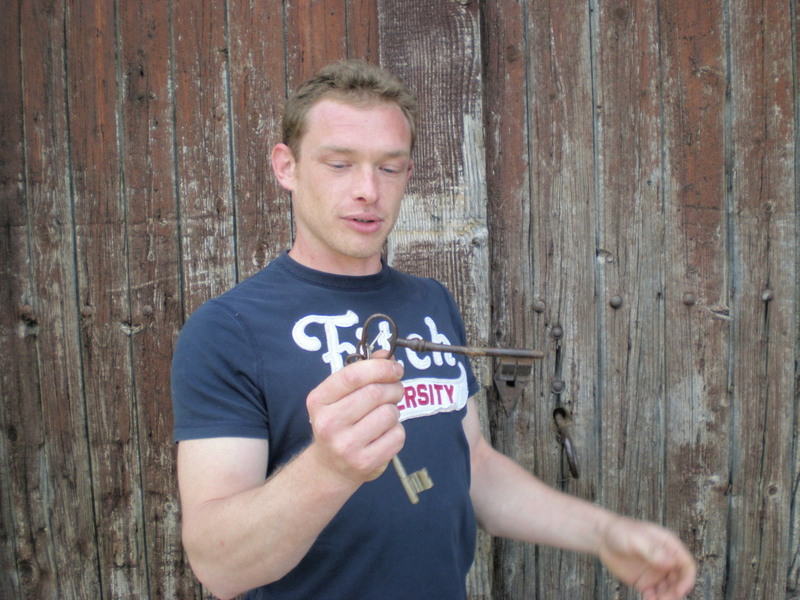 The first clue that this is an old-school winery: take a look at that key! These days, many international grape varietals like Chardonnay and Cabernet Sauvignon are grown in the region. This is an outgrowth of the area’s excellent farming conditions that led to its becoming the “wine basket” of France during the two world wars. The soil and climate are ideal for a lot of different grapes, and not having to stick to AOC designations has allowed winemakers to experiment. The name Domaine de Mairan comes from Jean-Jacques d’Ortus de Mairan, a scientist and physician who lived from 1678 to 1771 and owned the property during that time. Mairan was forward-thinking, and developed some of the beginning principles of the understanding of light and astronomy. Today, though, he’s primarily known for his observation and study of circadian rhythms, the internal clock that governs living organisms. His particular study was in plants, and he was the first to demonstrate that circadian rhythms definitively exist. Giving the winery that name means there’s a lot to live up to. Jean-Baptiste’s family has owned the land and made wine since the late 19th century. Jean-Baptiste’s grandfather was the first winemaker in the region to make single-varietal Cabernet Franc wine, and he raised the quality level of the winery’s production, giving it an excellent local reputation, especially in area restaurants. This is the bottom door to one of Jean-Baptiste’s old concrete tanks. Most of our producers have replaced the doors with stainless steel ones that open out. 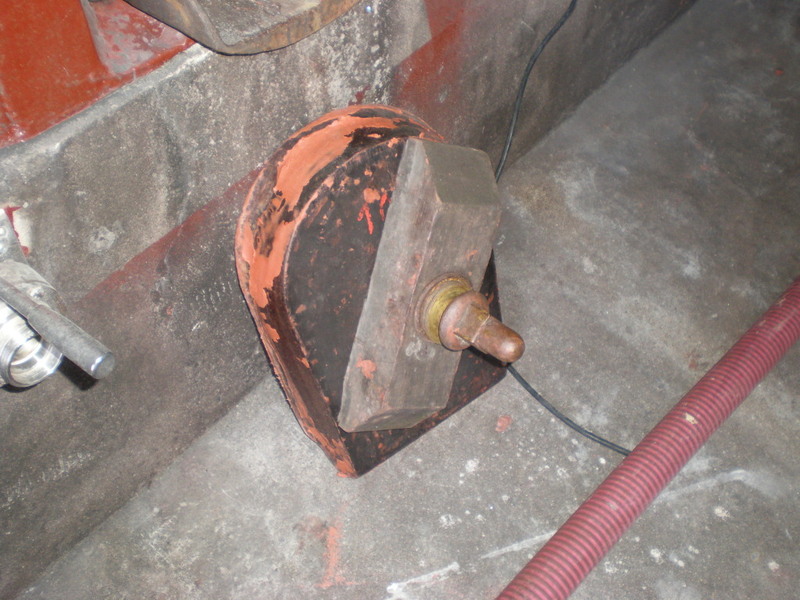 This one fits inside the tank and is sealed with putty — the weight of the grapes and juice in the tanks helps keep it in place. Jean-Baptiste’s operation is a quirky mix of state-of-the-art and tradition. He built a wine storage facility that’s absolutely the latest in energy efficiency. But the winery is the oldest of the old-school that we’ve seen yet. He has some stainless steel vessels for fermenting and aging white and rosé wines, and for fermenting some of the red wine. But the majority of the red wine aging that’s not in oak is done in very old concrete tanks. Concrete aging tanks aren’t unusual in France and Italy, but these are by far the oldest I’ve ever seen, with none of the modernizing our other producers have done. Jean-Baptiste likes using the unmodified tanks. Not only as a link to the past, but because they are great for winemaking as they are, even though they’re more work to use and maintain. Well, you can’t argue with success. And Jean-Baptiste’s wines are excellent. The Chardonnay Classique is aged in steel, and it tastes like the Chardonnay grape. No oak, no buttery flavors, just light and crisp, citrusy, and a little tropical fruit. It’s consistently one of our best-selling wines. He also makes a Chardonnay aged in oak, “Les Hauts de Mairan,” which is delicious – just six months in oak for a subtle oak flavor, and a little more roundness rather than straight out crispness. Some of you have asked for a Chardonnay with a little oak, so we plan on ordering a little of it later this year. He makes three reds: Merlot, Cabernet Franc, and Cabernet Sauvignon. Each of them is a nice representation of the grape. Medium-bodied, not overwhelmingly fruity, a little spice, and a little earthiness too. His Cabernet Franc is a quick-seller. We’ll have to wait until the next vintage is bottled to get some, because he has already sold everything he has. And no wonder, it’s a great wine. I’ve had a lot of good Virginia Cabernet Francs, but this is every bit as good as the best of them at less than half the price. We’ll be getting it later this year. The Cabernet Sauvignon is an old favorite of ours. It’s lightly oaked and has a ton of flavor, but not too much to overwhelm foods that you ordinarily might not serve with a Cab, like duck or roast chicken. 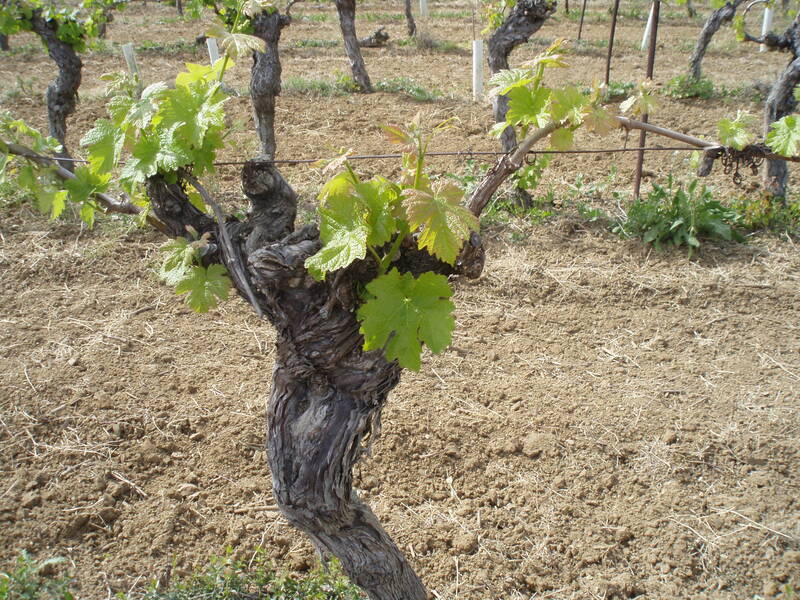 The vines of the Grenache Gris grapes used in Jean-Baptiste’s Aurore Boreale are more than 50 years old. Finally, the rosé. Jean-Baptiste renamed it Aurore Boreale (Aurora Borealis, or the northern lights) for the 2010 vintage, and it really is like a flash of pink light in your mouth. The wine is made from 70% Grenache Gris and 30% Merlot. Grenache Gris is a grape used almost exclusively for rosés, it’s different from White Grenache and the Grenache Noir found in red wines. Grenache Gris has a little more acidity and lighter fruit flavors, so it adds freshness and staying power to rosé. The Merlot adds riper fruit flavors and a little more body, and together they make an exceptional wine. When we visit our producers to do a tasting, they always taste with us, and it’s fun to see them unabashedly enjoying their own wines. Jean-Baptiste does too, but as with everything else, there’s just a little extra enthusiasm. We had the feeling that, at least at that moment, nothing in the world was more enjoyable than making good wine and sharing it with others. So if you’re in the Languedoc – a little southwest of Montpellier and east of Carcassone, be sure to stop in. In the meantime, we just got a shipment of the 2010 Chardonnay Classique ($11) and Aurore Boreale Rosé ($11). And we still have some of the 2007 Cabernet Sauvignon ($14) that’s tasting mighty fine. Even if you don’t always share Jean-Baptiste’s happy outlook, I can tell you that drinking these wines will improve many a day. The food in the Languedoc has a lot of influences – French, Spanish, Italian, and a little Middle Eastern too. And it varies throughout the region. One of the signature dishes in the eastern part along the Mediterranean coast is Bourride, a fish stew that’s also made in Provence. I made Julia Child’s version a long time ago, and it’s mighty rich – the fish poaching liquid is thickened with an extra eggy garlic mayonnaise to make the sauce, and then extra mayo is served on the side. It’s a great winter dish, all steamy goodness. But I came up with a much lighter version that’s great in late summer when it’s still nice outside in the evening. Not to mention when there are still great tomatoes, too. It’s sort of deconstructed, if you can stand reading another recipe using that adjective…Basically, fish and scallops are cooked in just enough highly-flavored poaching liquid. The liquid gets strained and used as a sauce for the seafood without thickening, poured over the seafood and slices of very good tomato. It’s then served with the garlic mayonnaise on the side and some of the mayo is also spread on toasted rustic bread. You should try making your own mayonnaise if you have a food processor, because it really makes this dish even better. But you can improvise a garlic mayonnaise if you have some good store-bought stuff to start. Don’t use a low-fat variety, because low-fat mayo is a little on the sweet side, and that’s not what you want in this dish at all. You can make the mayo and poaching broth in advance, then poach the fish right before you serve it. It goes perfectly with Jean-Baptiste’s Chardonnay or rosé. Who knows, you might decide that nothing in the world is more enjoyable! Put the garlic in a small saucepan with ¼ cup of the olive oil. Place the pan over medium-low heat. The garlic will start to color in about 8 – 10 minutes. When it’s just golden but not brown, watch it carefully – you want it just turning brown — strain the oil, reserving both the oil and the garlic and let them cool to room temperature. Chop the cooled garlic very finely. Combine the mustard, egg yolks, lemon juice, and salt in the bowl of a food processor fitted with a steel blade. Turn on the processor to combine everything. Scrape down the sides of the processor if necessary and leave it running. Combine the remaining olive oil and vegetable oil in a liquid measuring cup. If you have a Cuisinart food processor with the white pusher that has a small hole in it, pour the olive oil that was used to cook the garlic into the pusher and let it fall drop by drop from the pusher into the bowl. If not, open the top of the food pusher part of the processor. With the machine running, use a ¼-teaspoon measure. Add a half of that quarter teaspoon to the processor at a time, giving about five seconds between each addition, until all the oil is in. Then take out the white pusher if you have it in, and start adding the rest of the oil from the measuring cup in a very thin stream – actually more like droplets than an actual stream, until all the oil is in. The mayonnaise will thicken up. When it’s done, mix in the cooled garlic and taste it for salt and lemon juice, and add a little pepper and fold in the chives. You can let the mayo sit at room temperature for an hour or so. If you refrigerate it, be sure to let it warm up to room temperature before serving. Cook the garlic in the olive oil as described in the homemade mayo instructions. Let them cool, then fold the garlic, oil, lemon juice, mustard, chives, and a little salt and pepper into the mayo. Taste for salt, pepper, and lemon juice and set aside. Toast the bread pieces (as many as you’d like) and brush them with a little olive oil while they’re still warm. Let them cool. Just before serving, spread the bread with a little bit of the garlic mayonnaise. Preheat the oven to 200 degrees F (or 180 if your oven will let you do this). Get yourself a platter that can go in the oven and hold all the fish as well, preferably one with sides that allow you to hold some liquid in there too. Bring the poaching liquid to a boil, then turn the heat down to very low. Add the fish and scallops and cook for about 6 minutes, then check to see if they’re done. (Cutting into a piece of fish or scallop should show everything opaque and barely white, nothing translucent.) There should be enough liquid just to cover all the seafood, if not add a little boiling water. When they’re cooked, carefully remove them from the liquid onto the platter. Spoon a little of the liquid on top of the fish, then put the platter in the oven to keep everything warm. Strain the poaching liquid and put it back in the pot or a saucepan. Bring it to a boil over high heat and cook it for a few minutes to reduce it a little. Taste the liquid to see if it needs more salt or pepper. Take the platter out of the oven and arrange the tomato slices on top. Spoon some of the liquid over the tomatoes and fish. Then drizzle the top of everything with a little olive oil, and sprinkle some coarse salt on the tomatoes. Put some of the poaching liquid in a sauce boat for serving at the table. Divide the remaining mayo into as many small bowls as you have people eating, use it as a dipping sauce for the seafood. Serve the bourride immediately, with the mayo-coated toasted bread slices. This entry was posted in Bourride, Domaine de Mairan, Languedoc wine, recipes, Tom Natan, Travel, Uncategorized, wine delivery washington dc and tagged Aurore Boreale Rosé, Cabernet Sauvignon, Chardonnay Classique 2010, Domaine de Mairan, everyday reds, everyday whites, first vine, French wine, Late Summer Bourride with Fresh Tomato, rose, seafood recipe, wine storage. Bookmark the permalink. 7 Responses to Is this the world’s happiest man? I wonder if JB wants to switch jobs, even if just for a couple of weeks? Can’t wait to try the aurora boreal. I’m sure he’d be happy for you to help! 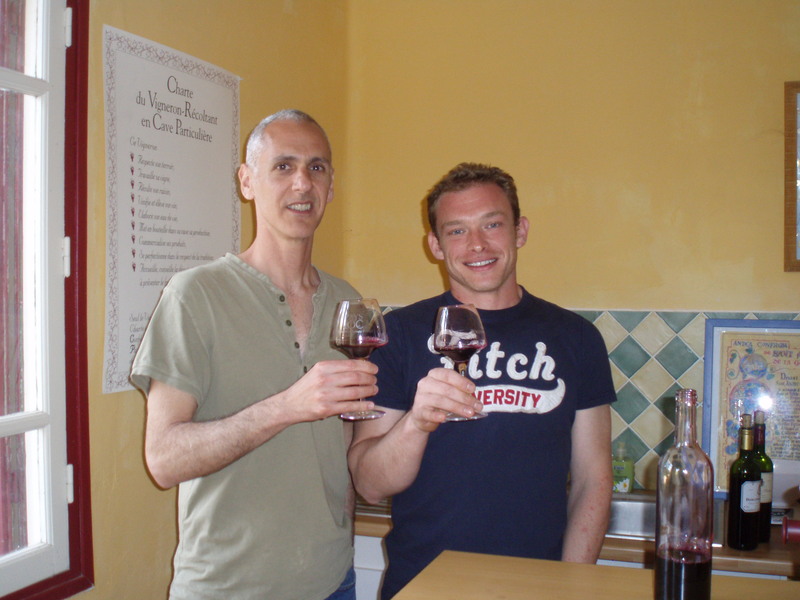 As the largest consumers of Jean-Baptiste’s wine in the US (at least that is what Tom told us! ), I have to say that drinking his wine makes us happy too….and we have great memories of visiting him in Puisseguier! Sara, you and Chris definitely are the #1 individual consumers of Domaine de Mairan wines in the U.S.! I hope that we can get Jean-Baptiste here to DC for tastings someday, but with the new baby it’s going to be tough. That’s a beautiful aioli recipe. Cooking the garlic first, thus removing some of its pungency, is such an interesting spin. I loved reading about Jean-Baptiste too. People that are following their passion are usually super-happy. Thanks, Sue! The raw garlic in the aioli isn’t a problem if you add it to the poaching liquid because it softens the rawness a bit, but it’s less pleasant just on the bread uncooked. And normally I love raw garlic! JB’s enthusiasm is infectious. If I didn’t already know how hard the work is, I’d be saving my pennies to move there and make my own wine.